As a global leader in digital security, Gemalto (formerly SafeNet) brings trust to an increasingly connected world. Proven Gemalto know-how helps authenticate identities and protect data, keeping them safe and enabling services in personal devices, connected objects, the cloud and in between. Gemalto solutions from Westcon are at the heart of modern life, allowing delivery of secure digital services for billions of individuals and objects. 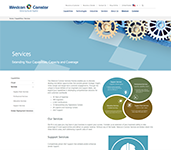 Why Partner with Gemalto and Westcon Security? Gemalto technology ensures the security of identities and data – and their communication between organizations and people – as well as devices in the fast-expanding Internet of Things. 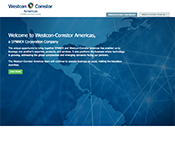 Westcon Security connects you with resources and opportunities that accelerate your growth in the enterprise security space with the Gemalto portfolio. The Gemalto Cipher Partner Enablement Program empowers your sales organization to connect with potential customers and find new ways to drive success through a mix of product and role-based sales training and certification opportunities. It all starts with essential Gemalto Sales Professional (GSP) Certification. 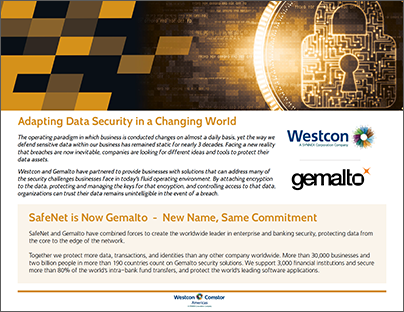 Westcon and Gemalto have partnered to provide businesses with solutions that can address many of the security challenges businesses face in today’s fluid operating environment. By attaching encryption to the data, protecting and managing the keys for that encryption, and controlling access to that data, organizations can trust their data remains unintelligible in the event of a breach.